You may be like most people, not knowing much about what’s available to make your life easier, safer and more enjoyable. As Stephen Covey wrote in his book “The 7 Habits of Highly Effective People,” “Start with the end in mind.” So, with a little studying you’ll get an idea of what new technologies are out there, along with their benefits and costs. Think of everything that you may desire now, and in the future, and design your system based on those long-term goals. You can start with what you need now and add over time to complete your goals. If possible, use separate components for easier use and improved picture and sound. Plus you’ll enjoy them much longer. Custom designed home theater system, starting around $15,000. Many newer homes have what’s known as “structure wiring.” The enclosure is usually built into a closet or pantry wall. This hub is where all the cables from Cox, CenturyLink or a satellite dish are interconnected to the outlets in each room for your telephones, TVs, internet and computers. This center allows easy connectivity. Some homes have wires sticking out of the family room wall. These wires are usually from the surround sound system to rear speakers and music speakers in other rooms. Check your rooms and patio to see if there are speakers in the ceilings and volume controls in the walls for house music. 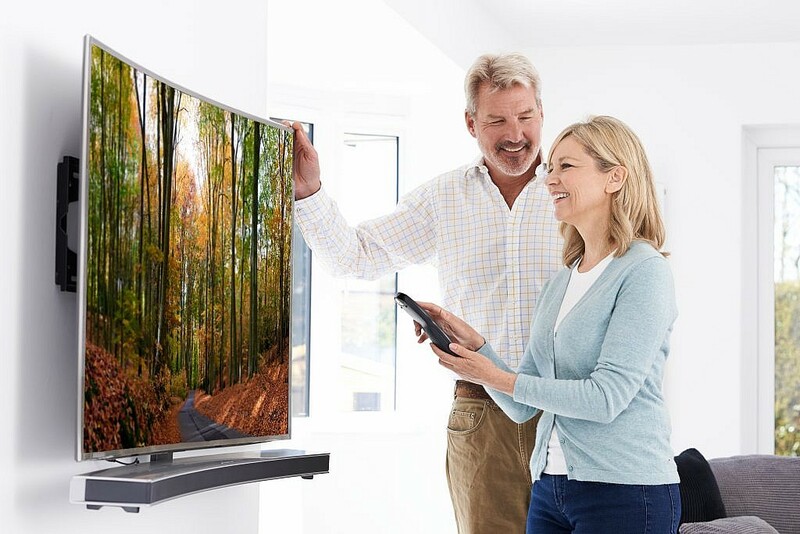 The new flat TVs are very different than the TV sets of yesteryear. It’s often a challenge to make a new TV fit into the original niches. “Think about remodeling your old niches into a beautiful media wall that accommodates the new bigger TVs. Your TV can be flush on the wall, and you can add a swivel mount for the wider viewing,” explains Jensen. Now you can totally hide your system because many new smart remote controls use radio frequencies instead of IR to operate your system through wooden doors and walls. 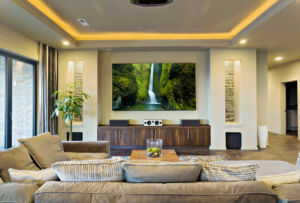 Adding two, three or four additional audio speaker zones allows you to watch a show in surround sound in the family room and at the same time listen to the same or different music through speakers in other areas. New alarms have touch screens to make them much easier to use and are more attractive. They use cell phone technology to contact the central station, plus it can also contact you on your smartphone. Many use wireless connections to your doors and windows so there is no new wiring needed. Install overt outdoor cameras so potential thieves can see them, or concealed indoor cameras (known as Nanny Cams). See who’s at the door, or how your sitter or cleaning crew are doing on your Smartphone, computer or TV from just about anywhere. Never walk into a dark house again. Easy automation can turn on inside and outside lights at dusk, and off when desired even if you aren’t there. This is another great thief deterrent. You can also reduce power usage and costs with automated thermostats, drapes and shades. Would it be convenient to use your smartphone or tablet to control your system? Or to operate your lights, thermostats or other automatic devices? How about using just one pre-programmed remote instead of the many remotes you already have? With just a tap, it will turn your TV and system on, raise or lower volume or change channels easily. Having a hard time understanding TV dialog or have poor sound in your room? The new thin TVs don’t emit a quality sound because there is no space for good speakers. Large rooms with smooth surfaces create echoes and make the sound even worse. These two issues can cause big problems for anyone as we get older. Hopefully these ideas have helped inspire you to make your life a little easier, safer and more enjoyable.